Between (the now filled in) Jarrow Slake and the western edge of South Shields sits a very distinct corner of Tyneside known as Tyne Dock. Named after the large dock which eats into the river’s southern bank, it is as easily identifiable on maps as almost any other geographical feature in the region. Which makes it a bit of shame that it has now almost gone, and is unlikely to feature in blue on the next edition of the OS map. Incredibly, the Tyne Dock basin was dug out by hand in the 1850s – much of it by veterans returning from the Crimean War. As part of the general industrial surge of the day, it was deemed necessary to create births for the growing river traffic – and the new ‘marina’ could take, it was said, some 500 vessels. Opened in 1859, Robert Stephenson made the dock gates and William Armstrong made the engines to power them – and they were still in use until about 20 years ago. But it was the drive of Jarrow shipbuilder Charles Palmer which saw the dock’s construction brought to a conclusion. Keen to compete with the railways in the transportation of coal, the great yard was Palmer’s response – built to take mighty new colliers such as the John Bowes. A proud community grew up around the dock, of course – much of it made famous by the novels of Catherine Cookson, who was born at 5 Leam Lane, Tyne Dock in 1906, just as the yard was approaching is peak. With the decline of the industry and the growth in the sheer size of visiting ships, the dock’s usefulness began to fall off. Inevitably, the developers’ eyes began to turn to the possibility of reclaiming the watery 50 acre site. In the 1980s, much of the southern area of the dock was in-filled, reducing its size by a good two-thirds. Then, in November 2009, a decision was made to complete the process by using material dredged and dug from the river during the excavation of the second Tyne Tunnel. This process has now been completed, and only a small sliver of the old Tyne Dock remains – to be filled with spoil as and when it becomes available. Then the area will be ready for new commercial development. That’s progress for you. There’s a neat little piece here about Tyne Dock and its community. Jarrow Slake, that oddly-named area of reclaimed land on the south bank of the Tyne neighbouring St.Paul’s Church, has a recorded history going back to the time of Bede. The area was then a large expanse of mud-flats into which the River Don wound before emptying itself into the Tyne – but at high tide would fill with water, hence its original name of ‘King Ecgfrith’s Port’, named after the Dark Age Northumbrian king who gifted the land to the monks of Jarrow. In time, a new name came into use: Jarrow’s Lake – which in turn became corrupted into Jarrow Slake. Little more than a treacherous expanse of gooey mess – as well as an unofficial bird sanctuary – for centuries, it was eventually put to good use in Victorian times as a pond for timber seasoning, for which it served its purpose for around a century from the 1870s. The Slake was also home to an isolation hospital for several years from around 1930, to which access was gained via a catwalk. In 1972, reclamation work began, and the area was used as a landfill site for some time. Eventually amalgamated into the surrounding landscape, the Slake’s 120-acre muddy expanse finally disappeared for good in the early 1980s. Latterly it has been used as a car distribution terminal for Nissan. For some fabulous photos of the old Slake, see here. And the area, on a map, as it is now – still, pleasing, called Jarrow Slake! P.S. The illustrated gibbeting is probably that of William Jobling in 1832 (but that’s another story, see here). Though there is no sign of the cage, the artist may have omitted it in error. Well, sort of. 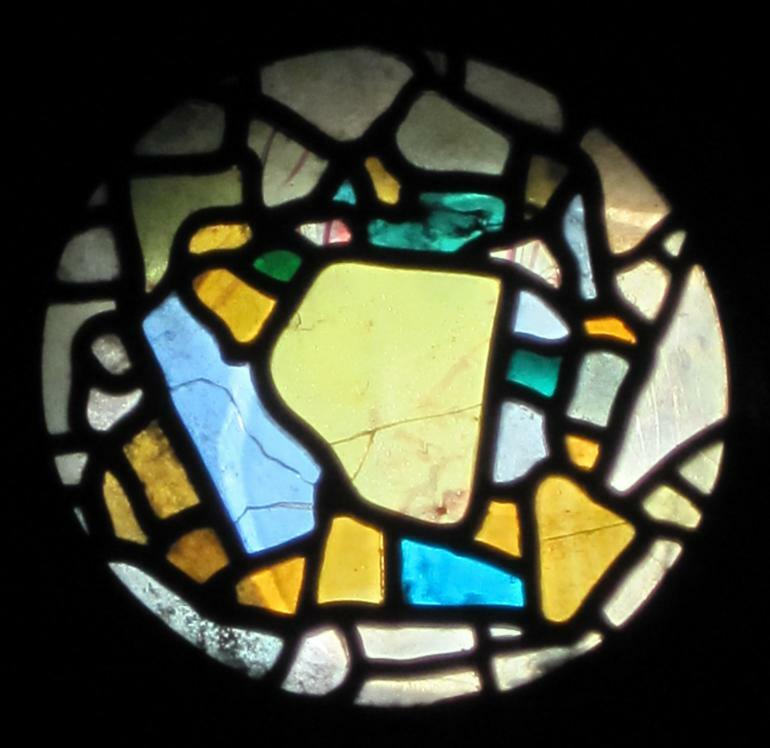 It is certainly the oldest stained glass that is known to still form part of a window – but we’ve cheated a bit, because this rather random mosaic was thrown together by craftsmen thirty-odd years ago using pieces of ancient glass turned up in a dig in the 1970s. Professor Rosemary Cramp had been poking around archaeological sites in both Jarrow and nearby Monkwearmouth for more than a decade before she fell upon the above specimens in a particularly significant find at the former site during 1973-74. A decision was soon made to put them on display in the surviving Anglo-Saxon chancel at St.Pauls, the 7-inch diameter window ever since being claimed as the world’s oldest of its type. The thing is, similar fragments found at Monkwearmouth are probably older, based on the theory that the Wearside monastry pre-dated that at Jarrow by about a decade (670s as opposed to 680s). Though it is not possible to accurately date glass, the Venerable Bede’s writings confirm that such glass was being fitted in the North-East monastries from around 675 – which means that Monkwearmouth must have had it first, followed by Jarrow when it was itself constructed a little later. So, there you have it: yet more Tyne-Wear rivalry, this time with the Wearsiders coming out, we think, on top. But until they get their bits and pieces into a functioning piece of kit, the Tyne will still have the oldest stained glass window in the world. Well, as I say, sort of. P.S. Fragments of glass from the Monkwearmouth site can be found on display at several locations throughout Sunderland, namely, St.Peter’s Church, Sunderland Museum & Winter Gardens and (from April 2011) The National Glass Centre. Bede’s World Museum, Jarrow, contains fragments from its own site, in addition to that on display in situ in the old church itself. A nondescript hole in the ground in a corner of a patch of landscaped ground in Hebburn is the spot in question. Presumably an old natural spring of sorts, it used to sit little more than a yard from the old Bede Burn which meandered this way - a waterway which now lies buried under (or perhaps diverted around) the modern paved area which frames the well itself. Legend has it that the famous Bede drew water from the well as a boy, and later sent monks there to fetch water when he was a priest at nearby St.Paul’s Monastery. All very fanciful, though there has been some recent speculation that the ‘bede’ in question derives from the Anglo-Saxon word baed, meaning a bathing place. Local historian Brand stated that in the 1740s it had long been a custom to bring sick and disabled children to the spot to be dipped in the healing waters, after which a crooked pin would be dropped into the little pool. Midsummer’s Eve would also bring the locals to the site in large number for various festivities, including bonfires, music, dancing and sports. Until the urban spread of the late Victorian era, the well and its immediate environs were something of a beauty spot. The incursions of industry and the like changed the area beyond recognition as the Edwardian era blew in, and the site underwent many changes during the twentieth century – but has somehow managed to hang on to its place on the modern OS map as a site of antiquarian interest in the area now known as Campbell Park. For an excellent picture history of the site, see here. The Tyne Tunnels are a series of three byways (pedestrian, cycle and vehicular) which pass under the River Tyne between Jarrow on the south bank and Howdon on the north. The road tunnel forms a section of the main arterial A19 trunk road. They were constructed during 1947-67 as a result of the passing of the Tyne Tunnel Act – though the scheme had been proposed a decade previously by the Durham and Northumberland county councils. Post-war frugality delayed the vehicular underpass, but the pedestrian and cycle tunnels were completed and opened by 1951 – both stretching some 900ft and lying around 40ft below the river bed. The huge wooden escalators at either end are record-breaking constructions in their own right, but will soon be superseded by more modern affairs. The much larger and longer (5,500ft) road tunnel was eventually completed in 1967, and was ‘opened’ by The Queen on 19th October of that year (though it was not opened to traffic until 1968). It has always been a toll tunnel – originally 2s 6d for cars (now £1.20). A second vehicular tunnel was completed in February 2011, and, as I write, the old tunnel is undergoing a period of closure for renovation. The new ‘double-tunnel’ will then be re-opened fully in December 2011, by which time the revamp of the pedestrian-cycle tunnel will be well underway. By the end of 2012 all of the tunnels should be fully functional and modernised – though the wooden escalators will be preserved for posterity. After all, the tunnels are Grade II listed. RMS Mauretania is, or rather was, the most famous ship ever built on the Tyne. It emerged from the Swan, Hunter & Wigham Richardson Yard at Wallsend in 1906 – the largest and fastest vessel in the world at its launch. She was one of the most iconic ships in maritime history – the flagship of the Cunard Line and holder of the transatlantic Blue Riband for 22 years from 1907. The construction of the ship took around two years prior to its launch on 20th September 1906. She sat in the river for a further year being fitted out to her famous high standards, and commenced trials in September 1907. She left the river amidst great ceremony the following month to be delivered to Liverpool, where the world’s largest moving structure embarked upon her maiden voyage in November 1907. She plied her passenger trade across the Atlantic for several years, stacking up the speed and time records – making 88 perfect crossings of the ocean during 1908-11 alone at an average speed of over 25 knots. During the Great War, Mauretania was requisitioned by the Admiralty. She was only ever armed during her wartime service towards the end of hostilities, but helped 10,000 troops on their way to the doomed Gallipoli campaign, narrowly avoided being torpedoed, and was latterly converted into a hospital ship. She also transported troops hither and thither as needs required, including taking many soldiers back home to North America after the war. She returned to her Cunard service in 1919, but wear and tear soon began to show. An on-board fire then brought her home for a refit on the Tyne during 1921-22 – prompting great local celebration – before returning to her glorious transatlantic best. Cruises were also by then a part of her remit, carrying some of the world’s richest folk around the Mediterranean and further afield. A further upgrade to her machinery in 1923 at Southampton and Cherbourg provided a further boost to her career. She finally lost the prestigious Blue Riband to the German ship Bremen in 1929. She spent her latter days cruising the Caribbean, where a repaint earned for her the nicknames “The White Queen” and “The Wedding Cake”. Finally withdrawn from service in 1934, she sailed back to Southampton, was stripped, and, in 1935, was taken to the breakers yard at Rosyth. As she passed the mouth of the Tyne on her way north, thousands of mourners lined the shore, a flotilla buzzed lovingly around her creaking bulk, and local dignitaries paid their last respects in an on-board ceremony. The Mauretania then disappeared out of sight and into history. 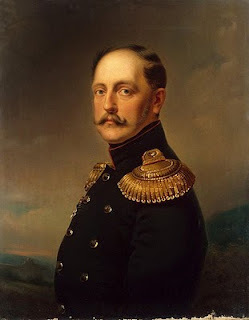 As part of the Europe-wide celebrations following the overthrow of Napoleon, a state visit to the UK was arranged for Alexander I, Emperor of Russia, in 1816. Accompanying Alexander was his 20-year-old younger brother (and future Emperor), The Grand Duke Nicholas. It was a holiday the young man would never forget. Nicholas must have fancied himself as something of a man of the world; an adventurer even. For, breaking free of the royal party, he determined upon some new personal experiences as part of what he must have considered to be his exciting ‘alternative tour’. Top of his list of ‘must-dos’ seems to have been to visit a coal mine; and so, in view of the pit’s famed reputation, he was ushered north to Wallsend Colliery. The esteemed dignitary’s arrival sparked a burst of regionalistic verve. 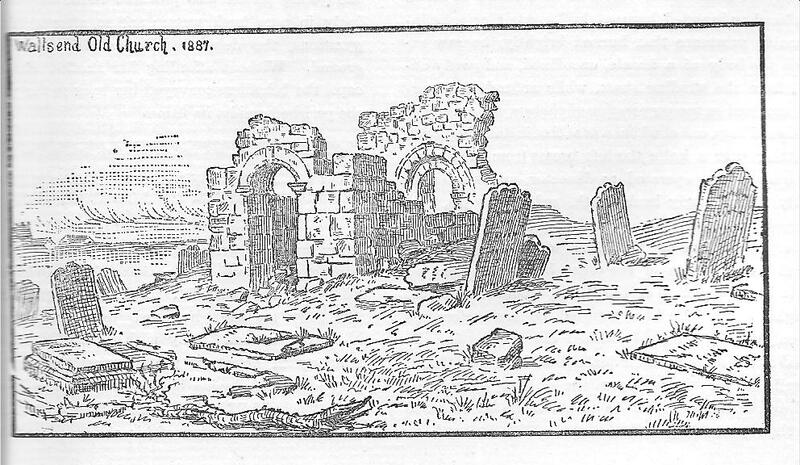 Wearside welcomed him first, with a visit to the river’s then famous bridge; before moving onto Newcastle and an introduction to Thomas Bewick, among others. Eventually arriving at Wallsend on 16th December 1816, he was given a prolonged tour of the colliery site, before being invited to change out of his glittering finery and into a deputy-overman’s outfit, prior to being escorted to the gaping hole that was the pit-head. The chosen mode of descent for The Grand Duke was considered the safest of its day. This involved the riding of a large iron hook at the end of a long rope, by which he was told to cling to firmly, whilst keeping himself clear of the black and dripping walls with a short stick during his long, slow drop. He hastily retreated, changed quickly back into his splendid military attire, and left Wallsend Colliery as fast as his carriage would carry him. Residents of the North Tyneside town will be familiar with their form, but many from further afield may not even be aware of the existence of this curious collection of stones. They stand in open fields between the town centre to the south and the Coast Road to the north, equally forgotten and ignored by both, apart from, that is, occasion visits by graffiti merchants. Built in the twelfth century with stones robbed from the Roman Wall, the Church of the Holy Cross was almost certainly constructed by the monks of Jarrow Priory in whose parish it then lay. It seems to have been used for public worship until 1798, by which time it had become so dilapidated that it was abandoned – a half-baked plan of repair leaving the building roofless and utterly unrecoverable. Much of the stone was requisitioned for the building of a barn and stable-block for the nearby parsonage, with the flock adjourning to a school-room for their services for nigh on a decade. 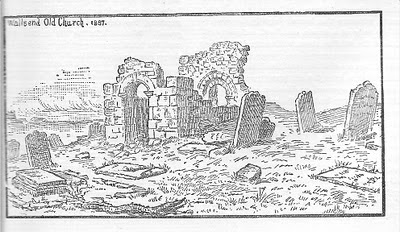 By-and-by a new church – that of St.Peter’s – was built and consecrated in 1809, and the old building was left to crumble. The image above dates from 1887; and in 1909 the site was tidied and a fence erected to help protect the remains. And as you can see, here, they haven’t changed much over the years. ‘Wooden Dolly’ statues have been a part of the history of North Shields for 200 years. There have been many incarnations over the years, beginning with a ship’s figurehead, morphing into a fishwife – and lately returning once again to its original form. 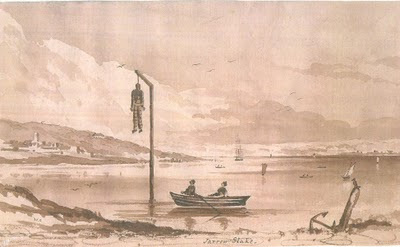 It all began in 1781, when a collier brig by the name of the Alexander and Margaret was attacked and ransomed on the high seas. Some time later, in 1814, the ship’s female figurehead somehow found its way to the town, where it was placed at the entrance to the Customs House Quay, on Liddell Street. In time, a tradition grew up among the local mariners to shave pieces from the figure to take with them to sea as good luck charms. This led to its repeated defacement and replacement – firstly in 1850, then in the 1860s, and again in 1901 when Dolly No.4 was raised, this time in the shape of a fishwife. But that wasn’t the last of it. Most of us have grown up with Dolly No.5, being the replica fishwife placed in Northumberland Square in 1958 (which still survives). But lately – in 1992 – a sixth statue has appeared in the very same spot previously occupied by numbers 1-4, being a throw-back to the original ship’s figurehead. This can be seen at Custom House Quay next to the Prince of Wales pub.